Zigi was born on 18th January 1930, to a Jewish family in Łódź, Poland and attended a Jewish school. When he was five years old his parents divorced but, because they were Orthodox Jews and divorce was frowned upon, he was told that his mother had died. Following his parents’ divorce he lived with his father and his grandparents. 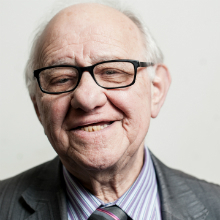 In 1939, when war broke out, Zigi’s father escaped to the Soviet Union, believing that it was only young Jewish men who were at risk, and not children or the elderly. However, in 1940 Zigi and his grandparents were forced to move into the Łódź Ghetto. During this year his father attempted to return to see Zigi but could not get into the ghetto. Zigi never saw his father again and still does not know what happened to him. In 1942, all children, including Zigi, were rounded up and put on lorries to be deported from the ghetto. Zigi managed to jump off the lorry and escaped back into the ghetto where he remained, working in the metal factory, until the ghetto’s liquidation in 1944. When the ghetto was liquidated, all of the people from the metal factory were put onto cattle trucks and sent to Auschwitz-Birkenau. On arrival, they were sent to the so-called Sauna building, where they were stripped, shaved and showered. Everyone else from the ghetto had to go through a selection, where a Nazi officer decided who was fit enough to work and those who should be killed immediately. Within an hour of the selection, those from Zigi’s transport who were not classed as fit for work had been murdered. A few weeks after arriving at Auschwitz-Birkenau, all of the surviving workers from the metal factory were sent to Stutthof concentration camp near Danzig. Once there, Zigi volunteered to work at a railway yard, where he was able to get more food. With the Soviets advancing, Zigi and the rest of his group were sent on a death march, arriving in the German naval town of Neustadt. Here they were told they were going to Denmark. However, before this could happen there was a British air attack, and during the chaos that followed Zigi realised that all of the Nazis had left. They were surrounded by British troops and liberated on 3rd May 1945. As soon as they were liberated, Zigi and his friends from Danzig and the march went looking for food. Three days after liberation, Zigi ended up in hospital for three months due to the effects of overeating after a long period of malnutrition. Once he left hospital, he and his friends were sent to a Displaced Persons’ camp. Zigi finally arrived in the UK in 1947, where he married and had a family. He now lives in Hertfordshire and regularly shares his testimony in schools across the country.